Summer is over and school has started here. With school starting, the cooler weather will slowly start to come about. Today we are having some rain and nice cool breezes. Makes me think about soup! There really is nothing better than a hot bowl of soup for dinner or lunch if you ask me. 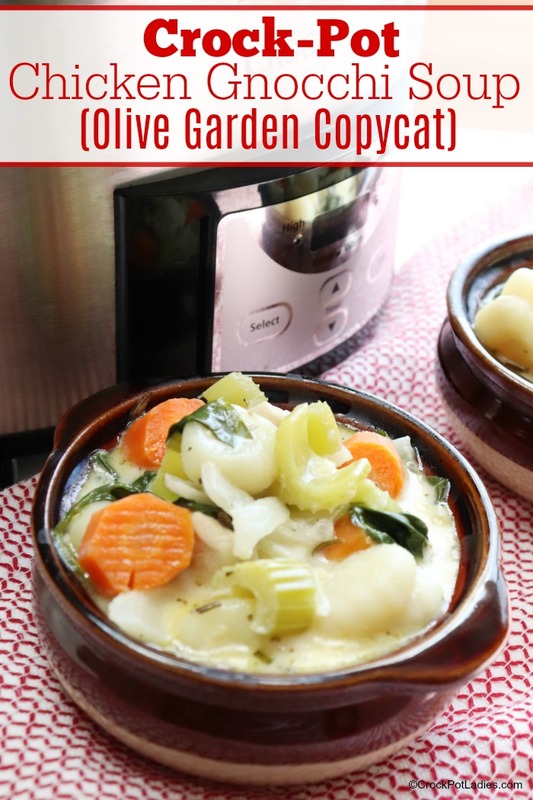 I have never tried cooking with potato gnocchi before and decided to give this soup a try after I had a bowl of an amazing Chicken Gnocchi soup at The Olive Garden. 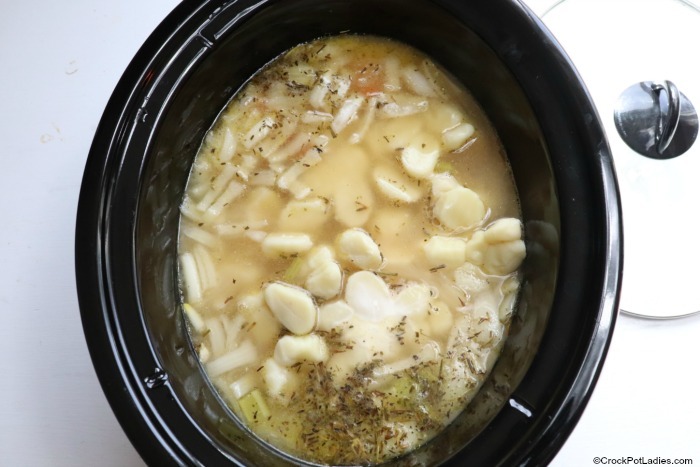 I knew immediately that I had to try and recreate that recipe at home in my slow cooker! I used home canned chicken chunks and chicken stock I made myself too. But you could easily use left over chicken, rotisserie chicken or even canned chicken too. And of course store bought chicken stock works just great too. I liked the flavor of the soup and the ease of making the recipe itself. This recipe is one I am going to make again and again for sure! Step 1: Add cooked chicken, chicken stock, celery, carrots, onion and Italian seasoning to a 4 quart or larger slow cooker. 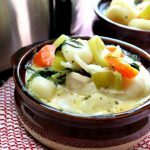 Cover your slow cooker and cook on LOW heat for about 6 hours until the veggies are nice and tender. Step 2: At this point you are going to add the potato gnocchi, evaporated milk and a little slurry made out of cornstarch and water which will thicken up the soup nicely. 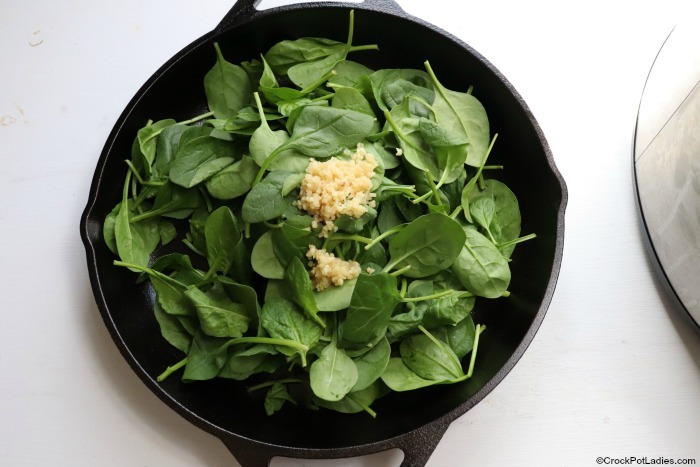 Step 3: In a skillet on the stove-top you are going to saute the fresh spinach in a little olive oil with the minced garlic until the spinach is slightly wilted and the garlic is aromatic. Add this spinach garlic mixture into the slow cooker and give everything a stir. Step 4: Let the soup cook for 1 more additional hour on LOW heat to let the flavors come together and allow the soup to thicken up. Step 5: Ladle soup into bowls are you are ready to EAT! You can use any sort of cooked chicken in this easy recipe. 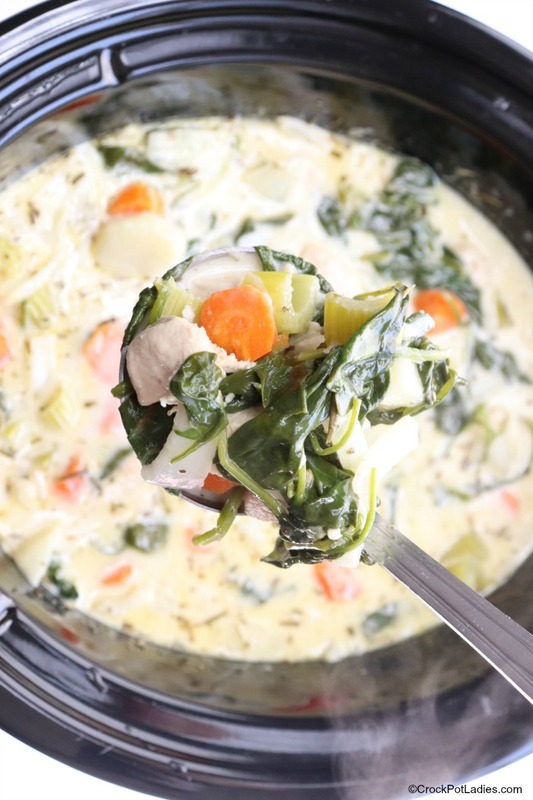 A store bought rotisserie chicken or canned chicken works in a pinch or use up some leftover chicken in this delicious soup. 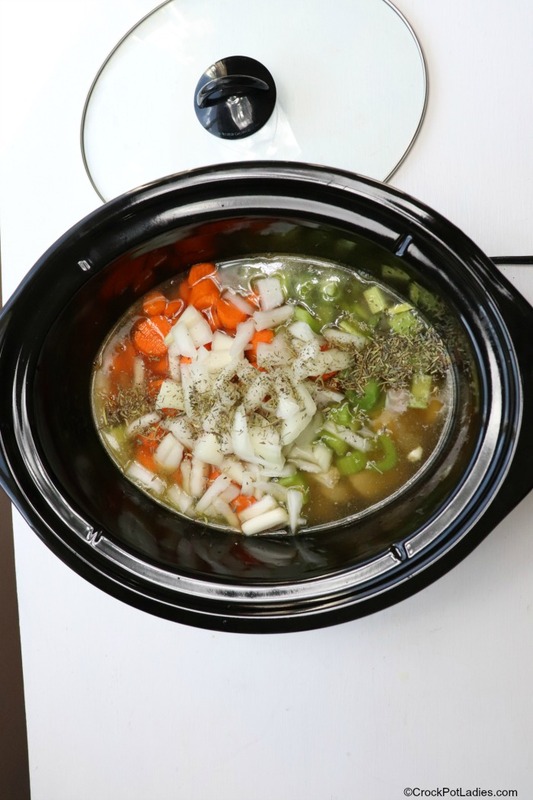 In a 4 quart or larger slow cooker add the chicken, chicken stock, celery, carrots, onion and Italian seasoning. In a small bowl mix together the corn starch and 1 tablespoon of water to create a slurry which will thicken the soup. After 6 hours of cooking time has passed stir in the potato gnocchi and the corn starch/water mixture and the evaporated milk to the slow cooker. In a small skillet add the olive oil, garlic and spinach and saute until the garlic is lightly browned and the spinach has wilted. Stir in the spinach mixture into the soup in the slow cooker and recover and cook 1 additional hour on LOW. Ladle hot soup into bowls and serve with bread or crackers for a delicious soup for dinner or lunch. Nutrition information based on 6 servings using 1.5 lbs. of cooked chicken in recipe. So glad you enjoyed it Robin. 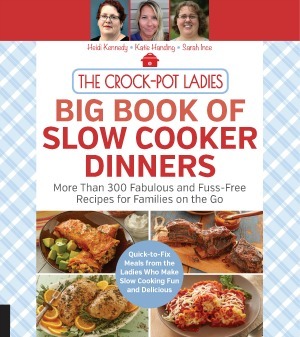 Being that the recipe cooks for 7 hours in the crockpot, is it possible to just use fresh uncooked chicken pieces? I would much rather use this instead of already cooked. Hi Debbie, while we have not tested this recipe using fresh uncooked chicken I don’t see why it wouldn’t work. Give it a try and be sure to come back and let us know how it turned out for you! Once cooked completely, can this be frozen? It made more than I can eat and hate to waste any, it was fantastic! Hi Mrshal, while we have not frozen this soup and reheated it I think it should be OK. Because the recipe calls for milk it may separate a little bit when frozen. But if it does you should be able to get it to come back together by stirring briskly (I think). I have sucessfully frozen chowders and other creamy soups but usually have to stir while reheating to get it to come back together. Otherwise the flavor will still be there regardless. Give it a try and let us know how it turns out for you. 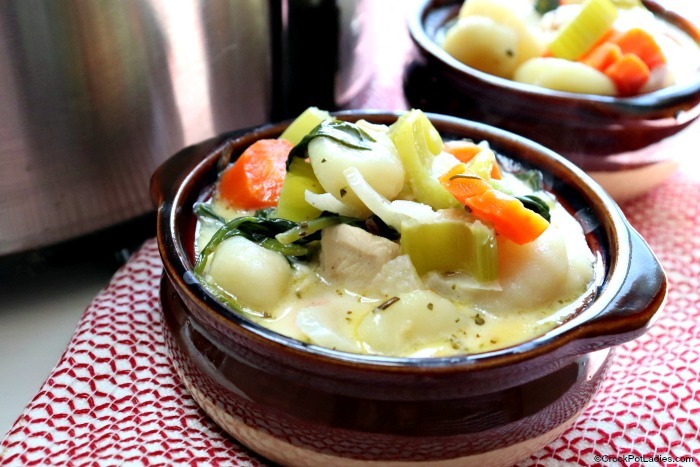 Is the gnocchi frozen or thawed? Hi Wayne, the gnocchi used in this recipe is fresh. If you’re in a hurry could you cook it on high for less hours? Hi De Ann, we have not tested this particular recipe on HIGH. But it should be OK. The standard conversion is half the time when cooking on HIGH. Let us know how it turns out for you! Did I miss something? I didn’t see a recipe for the gnocchi. The gnocchi is store bought. This recipe looks so easy to make and yummy! I am definitely making this. Love your site too — it’s very easy to find recipes that I want to make. Just have one question though — I used the Pinterest button on the recipe and saved it to my crockpot Pinterest board but immediately following that, it was removed by Pinterest citing that there was a copyright complaint. Very confused as I pinned it from your site. I use Pinterest to save recipes rather than clogging up my email. Can you please explain why this is happening? Hi Lisa, I received that notification from Pinterest as well. And it appears that someone decided to report the pin on Pinterest and Pinterest deleted it. I have contacted Pinterest and cleared the matter up and proved proper ownership and copyright to them. However it appears that Pinterest is unable to restore pins once they have deleted them. I am sorry for the confusion.